A mess that might be grow up to be a story someday. This morning, as I did my post-child infrequent and highly interrupted version of Julia Cameron’s morning pages (more like three quarters of a page, if I’m lucky) my daughter said, “My, look at all those words! It’s like a giant nametag!” Aside from making me laugh, her comment reminded me of the photo I took last weekend: the mess I was making with a ghost story in progress, whose birth story can be found here. When I talk about making a mess, this is what I mean. This is the kind of mess that I love. 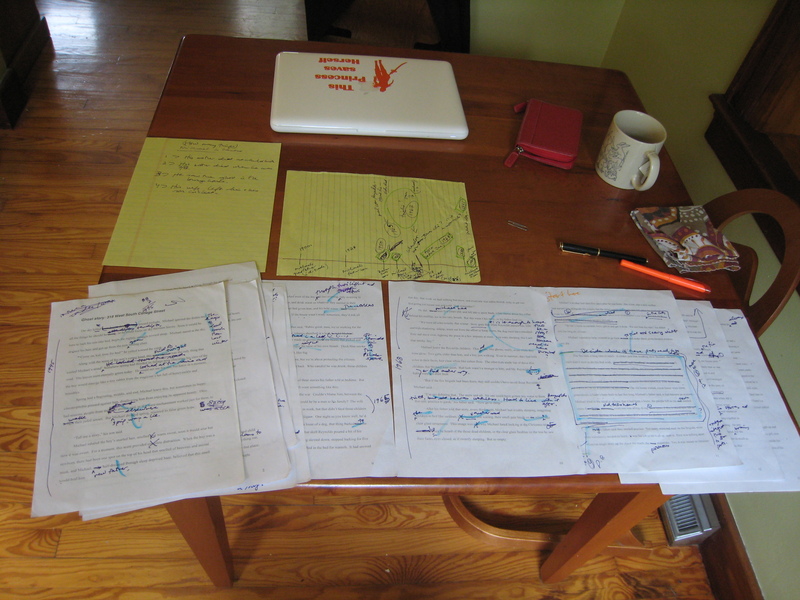 It’s all my mess (no one else has read this story, and all the scribbles, highlighting, and editing is mine! No judgement, no other voices in my head!) and here I’m trying to make order of it. It’s the first draft of a messy story that came from a terrible essay about one thing which grew into an essay about something else. Like the leggy cornflowers that we let go (“Let?” Who has time to even consider “letting” weeds grow; they just grow taller when I’m not looking) that bloom into flowers, whose color is unmatched in the rest of nature. The flower that needed to be. I’m not saying this mess is good, and I don’t know if it ever will be. But what else would I rather be doing? Maybe weeding the other flowers to give the cornflower more room. What about you? What would you weed today? What would you plant? This entry was posted in Uncategorized and tagged de-junking, fiction, Interdisciplinary Aesthetics, making a mess, words, writing. Bookmark the permalink.